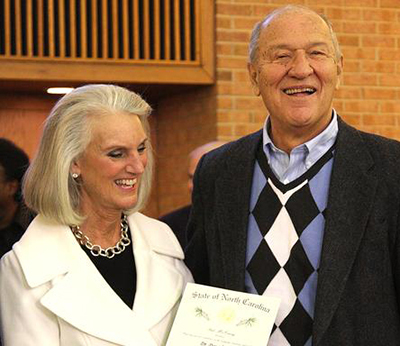 RALEIGH, N.C. (TAB, RNS) — Danny Lotz, the husband of Bible teacher Anne Graham Lotz, died Wednesday (Aug. 19) in a Raleigh, N.C., hospital after he was found unconscious in a swimming pool outside his home Aug. 17. Danny Lotz, 78, was a devoted Christian, a University of North Carolina at Chapel Hill basketball star and a dentist. But he was perhaps best known as the husband of Anne Graham Lotz and the son-in-law of Billy Graham, Anne’s father. A dedicated athletic supporter, Danny Lotz helped start the first chapter of the Fellowship of Christian Athletes (FCA) in North Carolina. He served on FCA’s National Board of Directors for 40 years and was named to their Hall of Champions in 2002. He also served two years in the Air Force, led numerous Bible studies and helped plant two churches in Raleigh, North Carolina. Lotz was awarded The Order of the Long Leaf Pine on Jan. 28, the most prestigious civilian award in North Carolina that is bestowed by the governor. The funeral service Aug. 30 will be live streamed from Providence Baptist Church, Raleigh, North Carolina, from 3–5 p.m. EST. This entry was posted in Home and tagged Anne Graham Lotz, Billy Graham, Chapel Hill. Bookmark the permalink.